A Cornish hen is a small fryer that weighs 1 to 2 lbs. 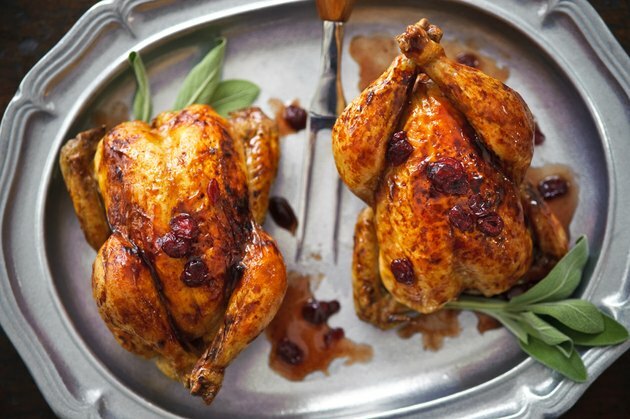 Like all forms of chicken, Cornish hens need to be properly handled to avoid food-borne illness. Part of this process is the defrosting of a frozen bird. The microwave allows you to thaw your hen immediately before cooking it. In the microwave, defrosting will take less than 20 minutes. Remove the Cornish hen from the packaging and place it on a microwave-safe plate. There is no need to wash the chicken prior to cooking it. Set the plate in the microwave. Turn the oven on following the instructions provided with the microwave for defrost. For example, some units have a switch or button that indicate the defrost cycle. Run the microwave for five minutes on the defrost cycle. Turn the hen over on the plate. Defrost it for an additional three minutes. Leave the hen in the microwave for 10 minutes once the defrost cycle ends. This will complete the thawing. Cook the chicken immediately after defrosting it. Avoid defrosting the hen days before cooking it. This may allow bacteria to grow. Wash your hands and the plate thoroughly after handling the raw chicken to avoid contaminating other foods or surfaces.